THE Warm Home Scheme being delivered by Bryson Energy will bring some cheer to many homes across Down District this winter. Since the launch of the scheme in 2009, the Warm Home Scheme has provided insulation and heating measures to over 1100 households in the Downpatrick area. As Downpatrick faces a staggering 30.5 per cent level of fuel deprivation (official figures), having a well insultated home and an efficient fuel burner is even more important than ever. South Down MLA Chris Hazzard has welcomed the scheme which is now targeting homes in a door-to-door campaign to tease out those who may not yet have availed of this service. Mr Hazzard said: “The Downpatrick area in particular is heavily reliant on oil heating as there is no gas supply. People will literally be putting their money up in smoke unless their home is well insulated and the heating system is working sustainably. Down District Councillor Eamonn Mac Con Midhe with Bryson Energy representative Chris Glass calling of Downpatrick householders who may be on benefits or entitled to them to avail of the Warm Homes Scheme. “A 15-year old boiler loses between 30-45 per cent of its efficiency which represents a huge loss of cash to a family who may be struggling on benefits. Replacing a boiler and getting well insulated is therefore a very positive step to take. While the world oil prices remain unstable, domestic fuel prices will vary and householders need therefore to make the best use of the fuel in their budgets as they can. Louis Magee, Referral Manager with Bryson Hose, said: “The information provided to the office on homes will provide local residents with a valuable Warm Homes Information Point. If anyone in the area wants to check their eligibility for the scheme, they can now call into their constituency offices where local representatives will be able to advise on their eleigibility for Warm Homes and assist them in submitting an application. You can also pick up leaflets in your local CAB and welfare rights offices. 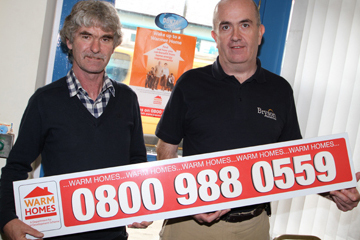 Contact Bryson Energy on the Warm Home Scheme – FREEPHONE 0800 988 0559. Want a warmer home this winter?